Here’s a thing I’ve been mentally wrestling with for a few days – I really want to be able to do a Bandcamp download code for each member of my mailing list, which is hosted with Mailchimp. I looked through the documentation for the site, but couldn’t immediately see how to do it. So I did what I always do when I need a problem solved. I asked Twitter. And my clever friend Lee told me how to make a custom field in the list database. 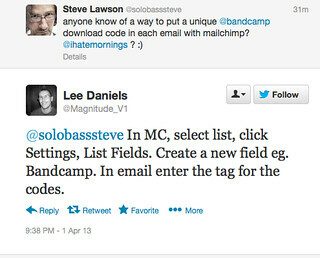 @solobasssteve In MC, select list, click Settings, List Fields. Create a new field eg. Bandcamp. In email enter the tag for the codes. So I did that, but there’s no import option for a single field… I then noticed that there is the option to ‘auto-update‘ your current list when importing data – which means I can export the list from Mailchimp to Excel, generate the codes in Bandcamp, add them to the newly created column in excel, then reimport the list to Mailchimp using the auto-update function. b) shedloads of spare download codes that you haven’t used with bandcamp. ahhh – nice – thanks!